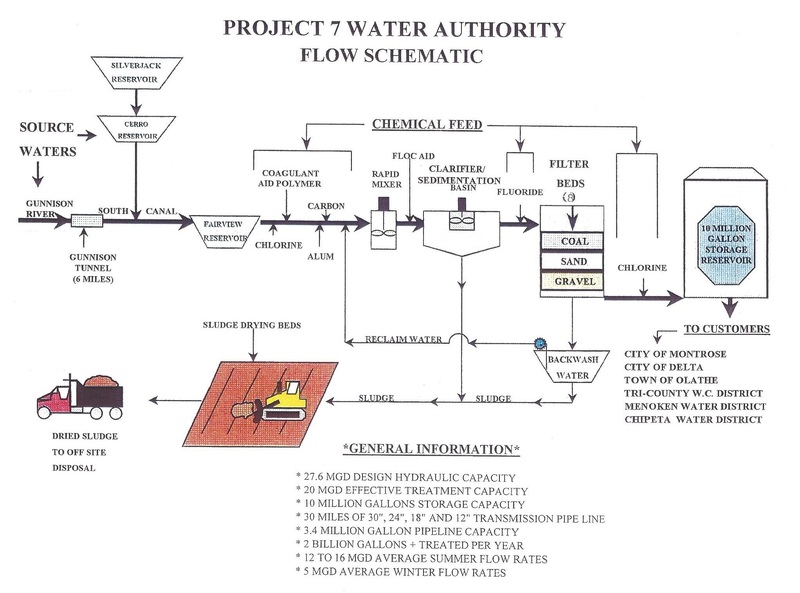 The majority of water supplied to Project 7 for treatment comes from the Blue Mesa Reservoir via the Crystal Reservoir. A small amount (<5%) comes from Silverjack Reservoir via Cerro Reservoir. The water travels down the South Canal a short distance and a regulated amount is diverted into Fairview Reservoir. Flow through the valve house is regulated by valves controlled from the plant. Chlorine is added to the water to lower the pH, which allows the aluminum sulfate to work more effectively. A non-ionic organic polymer is added to combine and add weight to the floc particles. 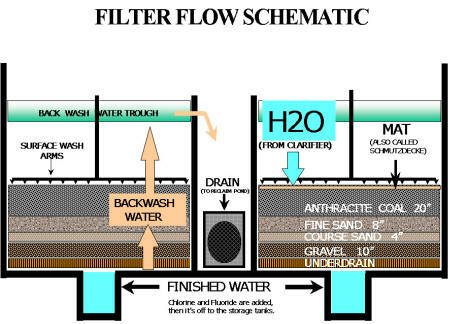 As the water passes through the clarifier, floc particles settle and the clarified water goes onto the filters. After the water passes through the filters, chlorine is added as a disinfectant. During this process, we reduce the raw water turbidity of 10 to 30 NTUs to around 0.5 NTU through the clarifier, and further reduce it to 0.05 NTU following filtration. Depending on the flow, a gallon of water could spend between 2 and 6 hours in this process. The materials we are attempting to remove in this process are particles of varying size and differing properties. Collectively this material is referred to as "turbidity". Fortunately, algae are not a significant issue for Project 7 as it can be in some operations. We do, however, have the task of removing finely divided particles. Some of these particles, if allowed, would take years to "settle out". 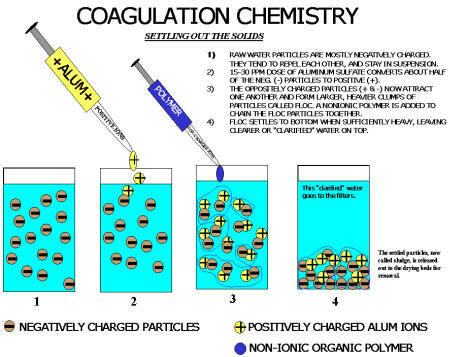 They are referred to as "colloidal". Therefore, we assist the settling process by the addition of aluminum sulfate to destabilize the electrical charge of the particles. This process allows for the formation of a settleable material called "floc". Additionally, we add an organic polymer to further enhance the settling process. The initial destabilization of particles and the formation of a micro floc take only a few seconds. Within a few minutes the floc particles begin to grow, resembling brown snowflakes. Eventually, the floc particles become denser than the water supporting them and begin to settle, entrapping the materials we are attempting to remove and become sludge. 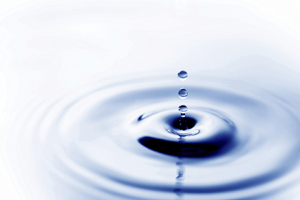 RAW WATER PARTICLES ARE MOSTLY NEGATIVELY CHARGED. THEY TEND TO REPEL ONE ANOTHER, AND STAY IN SUSPENSION. ALUMINUM SULFATE PARTICLES HAVE A LARGE POSITIVE CHARGE. THE OPPOSITELY CHARGED PARTICLES (+ & -) NOW ATTRACT ONE ANOTHER AND FORM LARGER, HEAVIER CLUMPS OF PARTICLES CALLED FLOC. A NON-IONIC POLYMER IS ADDED TO CHAIN THE FLOC PARTICLES TOGETHER. 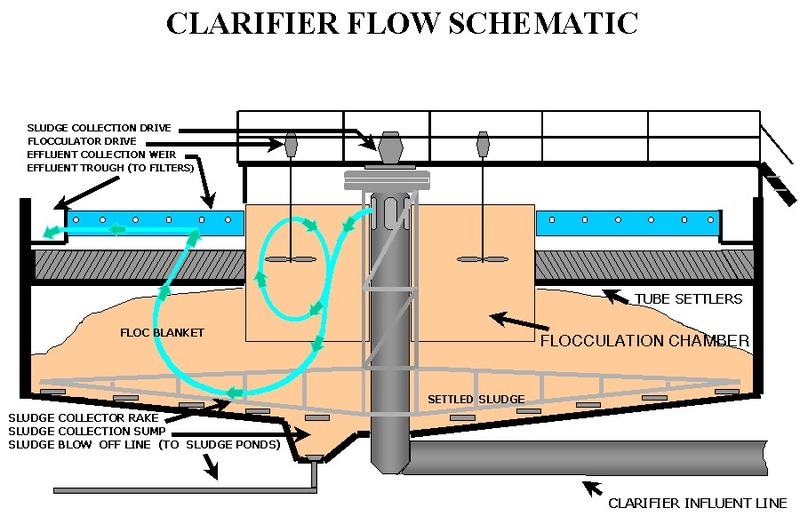 FLOC SETTLES TO THE BOTTOM WHEN SUFFICIENTLY HEAVY, LEAVING CLEARER OR "CLARIFIED" WATER ON TOP. The settled particles, now called sludge, are released out to the drying beds for removal. What Happens After Chemicals are Added? The chemically treated water enters the clarifier in the center where it comes in contact with gentle floc mixers and a floc blanket. During its travels through the clarifier, the water deposits its particles through contact with other floc particles. The floc particles continue to cling to one another until they become large enough to settle and become sludge. Tube settlers are positioned just below the effluent collection weir and are angled to provide a hydraulic loading against the particles. 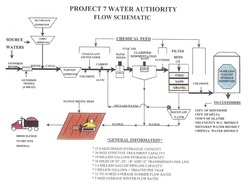 The clarified water spills into the effluent weirs, around the outer ring, and is then piped to the filters. Click picture below for a larger view. Use your browser's back button to return to this page. 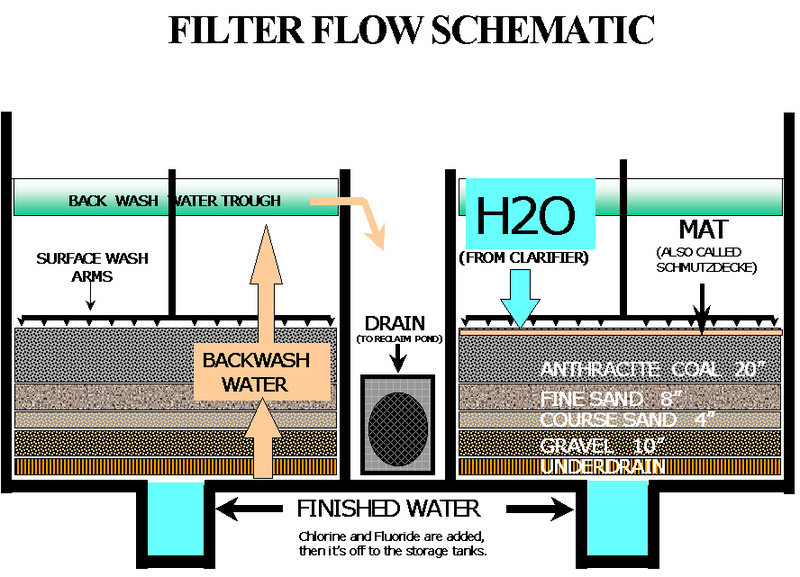 The water from the clarifier flows onto the top of the filters where it passes through the various media. The anthracite, (or crushed coal) does most of the work capturing the majority of particles. When a filter is first started, a mat is formed by the particles. This mat is called a schmutzdecke (pronounced shmoots-deck). The schmutzdecke helps capture more and more of the particles until the anthracite becomes so thick with particles that the filter will eventually require "backwashing" or cleaning. During the backwash, water is pumped at a high rate up through the filter to expand the filter media and allow the built up particles to escape and drain into our reclaim pond. The sludge from the backwash settles and the decanted water is returned to the raw water line for recycling. The last step in our treatment process is disinfection. Chorine is added as our primary disinfectant. This is the last barrier against any pathogens that may have survived the treatment process. To improve the taste, odor of our water, and to ensure a residual disinfectant in the outer limits of the distribution system we use chloramines as a secondary disinfectant. The “free” chlorine in the water is converted to chloramines by adding a trace amount of ammonia, forming chloramines. It should be noted that chloramines are toxic to fish. Unlike chlorine, chloramines cannot be removed by allowing the water sit out overnight. The chloramines can be removed by additives, which can be found in local pet stores. People who use home dialysis machines must also remove the chloramines. Contact your health care provider for more information.